1. Supports Windows 95, 98, ME, NT4, Windows 2000, XP, Vista, 2003, Win 7 & 2008, 2012, 8/8.1, 10. 2. Drag and Drop support of files. 6. Supports multiple doc formats, e.g. PDF, DOC, TXT, HTML, BMP, JPG, GIF + any other associated printable formats. 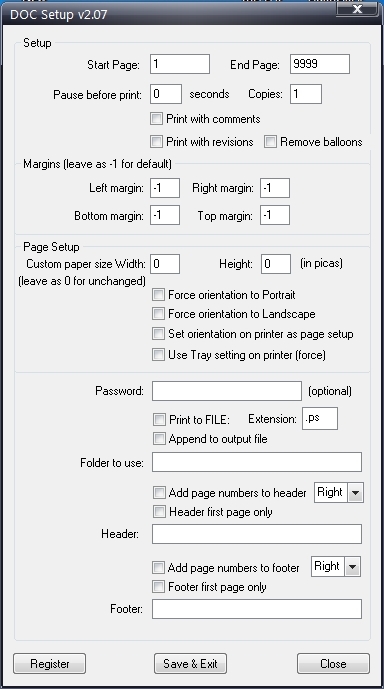 7. change printer settings during print job. 9. List order organizing Options. 10. Print Scheduler, for automating reports to print at a specified time on a specified printer. 11. Directory Monitor, that watches folders for documents and prints them to a specified printer, ideal for automation. 12. Command line options for automation from other applications. DOC Add-on 2.09 $20 - Microsoft Word 2000, XP, Vista, 7, 8/8.1 or 2003 or 2008 or 2010 / 2012 / 2016 or greater required. Page Range selection from filename e.g. SAMPLE_PAGERANGE2-4AAA.doc will print pages 2-4 of that document. Password support for batch printing pass worded files. Pause before print, will open then pause to allow for rendering time before printing the document. All these features can be changed throughout the batch list, they are set on a per file basis. Print multiple documents with ease. when people drop files into hot folders on your network Batch & Print Enterprise will automatically send them to the correct printer.